On November 17, 2013, the U.S. Senate passed the Employee Non-Discrimination Act (ENDA) – a bill that prohibits businesses with 15 or more workers from making employment decisions based on sexual orientation or gender identity. Ten Republicans joined with the entire Democrat caucus to pass the proposal 64-32. A religious exception was provided as an amendment to the bill to "prevent federal, state and local governments from retaliating against religious groups that are exempt from the law." Citing concerns of frivolous litigation, Speaker Boehner and other House Republicans have already said that they intend to oppose ENDA. A report from the Government AccountabilityOffice released this summer indicated that in the 22 states where there is some form of anti-discrimination law regarding sexual orientation and gender identity, "the administrative complaint data reported by states at that time showed relatively few employment discrimination complaints based on sexual orientation and gender identity." What this means for Iowa employers – the Iowa Civil Rights Act already includes sexual orientation and gender identity as protected classes for purposes of employment discrimination for businesses with four employees or more. But, with the proposed federal legislation, the heightened awareness and potential federal protections further underscore the need for Iowa employers to review written and unwritten employment policies and practices and include these protected classes in discrimination and harassment training for employees. Another practical concern for Iowa employers is to balance the protections for gay and transgender employees with the religious views of other employees. Religion is also protected under the Iowa Civil Rights Act and Title VII. Therefore, regardless of the protected class status, managers and employees should not be using any protected class status for purposes of employment decisions or to engage in harassing behaviors. 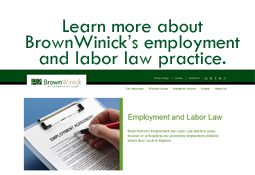 If you have questions about employment policies and practices regarding discrimination and harassment, you should contact your BrownWinick employment law attorney.